AUCTION DATE: TUESDAY OCT 27, 2015 @ 10:30 A.M.
2000 TRUMPF LASER L2530, 3000 WATT CAP, 4FT X 8FT DUAL TABLES,WITH TLF 3000 T TURBL LASER, APPROX 18,000 BEAM ON HOURS. 1997 TRUMPFV85 CNC PRESS BRAKE, 81’’ X 93 TON CAPACITY,MULTI AXIS CONTROL, S/N 883220. 2004 HACO CNC HYDRAULIC INITIAL PINCH BENDING ROLLS,4 ROLLS, TOP ROLLS 160mm, SIDE ROLLS 140mm, MODEL 4HBR206P, S/N 4267. 7.1’’ STOKE, 35-55 SPM, 25’6’’ X 20.5 SLIDE, SLIDE ADJ 3.5’’, 45.3’’ X 26.8’’ BOLSTER AREA,S/N EW110-568, EW110-569. 1996 PINES NO. 2 HYD MANDREL TYPE TUBE BENDER WITHDIAL A BEND CONTROL,S/N11235-96025. 1985 PINES NO. 2 HYD MANDREL TUBE BENDER, S/N 11235-85077. HEM V120-HA VERTICAL 20’’ TILTING BAND SAW, 7.5 HP, 1.25 X 60’’ BLADE WITH CONVEYOR AND FEED TABLE, S/N 723000. FORKLIFT, 24V, 4000 LB CAP, W CHARGERS. TOYOTA 5FGC20, 3600 LB CAP LPG FORKLIFT, 11380 HOURS. CROWN 3000 LB ELECTRIC FORKLIFT. MITSUBISHI ELECTRIC 4000 LB FORKLIFT, 2 STAGE WITH CHARGER. 2) FACTORY CAT ELECTRIC FLOOR SCRUBBERS WITH CHARGERS. 1986 FORD F-700 DIESEL, 20FT STAKE BED TRUCK, 57,000 MILES. 1995 FORD F-150XLT PICK UP TRUCK, V8, 95,000 MILES. PRESTO LIFTS ELECTRIC DIE LIFTS 2000 LB CAP, MODEL B778-2000. PRESTO 1000 CAP ELECTRIC FORKLIFT, MODEL C74A-15LC. OVER 200 SECTIONS OF PALLET RACKING. KUNDEL 1000 LB CAP GANTRY LIFT SYSTEM. ANVER 900 LB LIFT WITH STACKER. LARGE SELECTION OF OFFICE EQUIPMENT AND FURNITURE. OKUMA LNC8 CNC LATHE WITH OSP 700L CONTROL, 8’’ CHUCK, 12 POSITION TURRET, TAIL STOCK, CHIP CONVEYOR, S/N E273. OKUMA LB 15ii CNC LATHE WITH OSP 7000L CONTROL, 10’’ CHUCK, 12 POSITION TURRET,2 AXIS, TAIL STOCK, CHIP CONVEYOR, SMW QUICK 7.52 BAR FEEDER, S/N 3650. 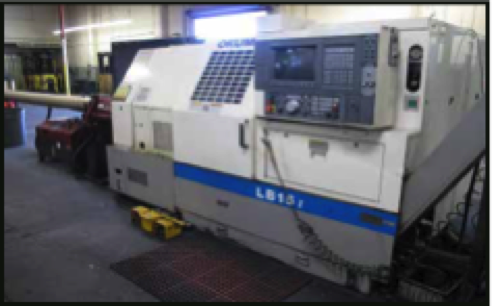 OKUMA LNC8 CNC LATHE WITH OSP 5020L CONTROL, 12 POSITION TURRET, CHIP CONVEYOR,SMW QUICK 7.52 BAR FEED, S/M C177. OKUMA LB 15 CNC LATHE WITH OSP 5020L CONTROL, 12 POS TURRET, CHIP CONVEYOR,B60 COLLET NOSE, TAIL STOCK, SMW OMNI BAR 65 BAR FEEDERS, S/N 0210-A092. OKUMA MODEL MX-55VA CNC VMC, CT 40 TOOLS, 20 ATC, 7000 RPM, S/N 0179. OKUMA MODEL MC-4VA VMC, WITH OSP 5020M CONTROL, CT 40 TOOLS, 20 ATC, S/N 111-9345. OKUMA MC-4VAE CNC VMC, WITH OSP5020M, CT 40 TOOLS, 20 ATC, S/N 0604-9891. HEM MODEL 1200-LAR HORIZONTAL BAND SAW, 12’’ CAP S/N 258687. GOFF-DISA SHOT BLAST SYSTEM WITH RECOVERY SYSTEM, MODEL 6BB/816DC. RICHARDS MULTIFORM BENDER, S/N 547-BBB. IR 30HP ROTARY AIR COMPRESSOR, SSR-UP5-30-125, 5500 HOUR APPOX,S/N P40U08134. LEROI 50 HP ROTARY AIR COMPRESSOR, MODEL W50SS. IR 15 HP PISTON TYPE AIR COMPRESSOR. 2011 GREAT LAKES AIR DRYER MODEL ERF-2JOA436. 2) SEMI AUTO TUBE POLISHERS. TRI MER MODEL M SIZE 50 5000 CFM POLYPROPYLENE WET DUST COLLECTOR. MURPHY ROGERS BAG HOUSE TYPE DUST COLLECTOR. 4) US PLATING MFG INDUSTRIAL POLISHING LATHES. SEPARATION DYNAMICS MODEL EUS-F OIL SEPARATOR. 10) MILLER CP-TS MIG WELDERS. 5) MILLER CP-302 MIG WELDERS. MILLER DIMNESION 302 MIG WELDERS. 5) HYSTER STAND UP ELECTRIC FORKLIFT, 24V, 4000 LB CAP, W CHARGERS. TOYOTA 5FGC20, 3600 LB CAP LPG FORKLIFT, 11380 HOURS. CROWN 3000 LB ELECTRIC FORKLIFT. MITSUBISHI ELECTRIC 4000 LB FORKLIFT, 2 STAGE WITH CHARGER. 1995 FORD F-150XLT PICK UP TRUCK, V8, 95,000 MILES. VARIOUS TYPE OF JIB CRANES, WITH HOISTS. HYDRAULIC SCISSOR LIFTS PRESTO LIFTS ELECTRIC DIE LIFTS 2000 LB CAP, MODEL B778-2000. PRESTO 1000 CAP ELECTRIC FORKLIFT, MODEL C74A-15LC. 140 SECTIONS OF PALLET RACKING, 18FT WITH MESH AND 48’’ DEEP OVER 200 SECTIONS OF PALLET RACKING. KUNDEL 1000 LB CAP GANTRY LIFT SYSTEM. ANVER 900 LB LIFT WITH STACKER. 1997 TRUMPF V85 CNC PRESS BRAKE, 81’’ X 93 TON CAPACITY,MULTI AXIS CONTROL, S/N 883220. 2) 1998 SEYI SUTHERLAND MARK 121-W, 121 TON GAP FRAME PUNCH PRESS,7.1’’ STOKE, 35-55 SPM, 25’ 6’’ X 20.5 SLIDE, SLIDE ADJ 3.5’’, 45.3’’ X 26.8’’ BOLSTER AREA,S/N EW110-568, EW110-569. 1996 PINES NO.2 HYD MANDREL TYPE TUBE BENDER WITHDIAL A BEND CONTROL,S/N11235-96025. LEROI 50 HP ROTARY AIR COMPRESSOR, MODEL W50SS. IR 15 HP PISTON TYPE AIR COMPRESSOR. 2011 GREAT LAKES AIR DRYER MODEL ERF-2JOA436. 2) SEMI AUTO TUBE POLISHERS. TRI MER MODEL M SIZE 50 5000 CFM POLYPROYLENE WET DUST COLLECTOR. MURPHY ROGERS BAG HOUSE TYPE DUST COLLECTOR. 4) US PLATING MFG INDUSTRIAL POLISHING LATHES. SEPARATION DYNAMICS MODEL EUS-F OIL SEPARATOR.